Build maemo-apps with openSUSE BuildService ? – It works ! The openSUSE Build Service is an open and complete distribution development platform. It’s the infrastructure for a development of the openSUSE distributions. But this powerful tool can do much more! The upcoming version 1.5 will also have cross-build support and thus be able to build e.g. ARM packages on x86 hardware . In last Friday’s blog entry about tabbed browsing for packages, I had asked for comments and opinions. There were quite a number of them, all of them very constructive. Thanks to all who participated! The overall feedback was positive, welcoming the change. To us, this means that we will indeed merge that code branch (yes, it’s largely working already, it’s not just a mock-up) to the main development line, and you will see that new user interface appear in the next versions of the yast2-qt-pkg package on FACTORY. Last month we started a new project called Contrib. It’s a shiny new community repository for openSUSE. In opposite of specialized repository (eg. Security:), Contrib is universal. It doesn’t matters if your package is a desktop application, or a network tool. Every type of package is welcome. Today, we celebrated a package number 100 (gparted)! Thanks to all involved folks! One hundred packages doesn’t look like a big repository, but consider we are active about a month and half and this is an important milestone for us. The bigger repository should be more attractive for end users, and a package maintainers too. Contrib release cycle is same as Factory, but we want to help users to use it now. So Contrib is also available for 11.1. So just add the repository and start to use it! It help us! If you maintain some interesting package in your home: project (or elsewhere), please follow instructions – New packages to Contrib and add your package to Contrib, so many users of openSUSE would use it! In this Field i edited :”http://news.opensuse.org/?ec3_ical”. I choosed regularly updating, but no Saving on the Remote Computer. There are many approaches to managing software packages. Some users like to use command line tools like zypper. Others prefer a GUI tool like the YaST2 package selector. 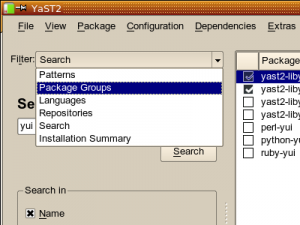 And even within such a GUI tool, there are many ways to deal with the packages you’d like to install, update or remove: Install a bunch of packages that make up a functionality like “KDE desktop” or “web development”, find one specific package with a known name, or just look through packages that are available. That’s why there are different filter views for those different approaches. Ugh… not good. Not even at this screen resolution. Now think about 800×480 netbooks and more verbose languages like German, French or Hungarian. No way to make this fit on the screen. And left/right scroll buttons are the last thing you want for tabs. kupdateapplet shows a popup that asks the user to send his/her hardware profile to the smolt project. I think kupdateapplet isn’t the appropriate application for showing this notification because smolt has nothing in common with update installation. I’ve written a tiny python-qt script that shows the smolt popup. You can find a package called smolt-qt in my build service home. Feel free to test and comment! Welcome to yet another installment of our Ruby mini-series. Capistrano (http://capify.org/) is a DSL written in Ruby for automating common tasks. While Capistrano is more often used for Rails deployment, it can easily be used for system automation as well. A while back, I put together a presentation for the local Ruby user’s group. The presentation covers a very brief intro to Capistrano for simple system automation. You can download it here. I’m aware of at least one typo (a missing single quote) in the slides, there may be others. The flash utility is known as “Flashrom”. chips (parallel, LPC, FWH and SPI technologies) in various packages (DIP, PLCC, SOIC). the various AMI/Award/Phoenix BIOS flashing tools out there. if your board happens to have an unsupported chip. It is free software released under the terms of the GNU General Public License version 2. Flashrom is a “normal” user space application, but it requires superuser privileges. most distributions out there work fine. of the failover/dual BIOS features advertised on some boards. For other usage instructions, please refer to the flashrom home page or the man page. chance that everything can be fixed.